Smash Hits now archived online! It's like punk never happened, innit? Loyal readers of this blog may recall that I have previously mentioned my passionate desire to have Star Hits/Smash Hits magazine archived online. Today is quite possibly the greatest day of my life because someone has finally made my wish come true. I could scarcely believe my eyes when I beheld the Smash Hits Internet Archive. I actually cried with joy as I explored the archive. I am a very emotional person, and I am not ashamed to say I did shed a tear (okay, a lot of tears) as I downloaded some back issues. YES, YOU CAN DOWNLOAD THEM! A lovely lad named Brian is lovingly and carefully uploading his personal collection of Smash Hits magazines. He has a pristine collection that goes all the way up to 1985, which for me, was the peak of 1980’s excess. 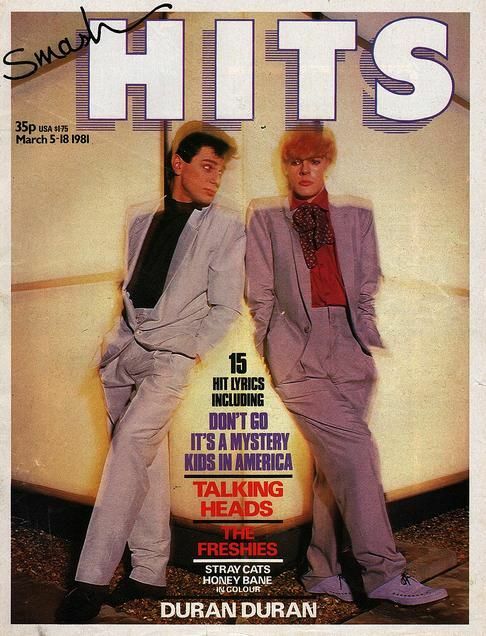 In the meantime, feast your eyes on this issue from March 1981, featuring Nick and Roger from Duran Duran on the cover, looking about as ridiculous as they possibly could. New Romantic fashions, dahling! Straight from the Rum Runner, into your living rooms! If you would like to read the blog that started it all, check out Like Punk Never Happened, and keep up with the new issues as they are uploaded. This entry was posted in Magazines, Music and tagged 80s, a dream is a wish your heart makes, duran duran, like punk never happened, nostalgia, smash hits, star hits on June 25, 2011 by mekkalekkah.